D'Alessio Park in Cherry Hill, New Jersey is coming together, and local kids are preparing for liftoff! 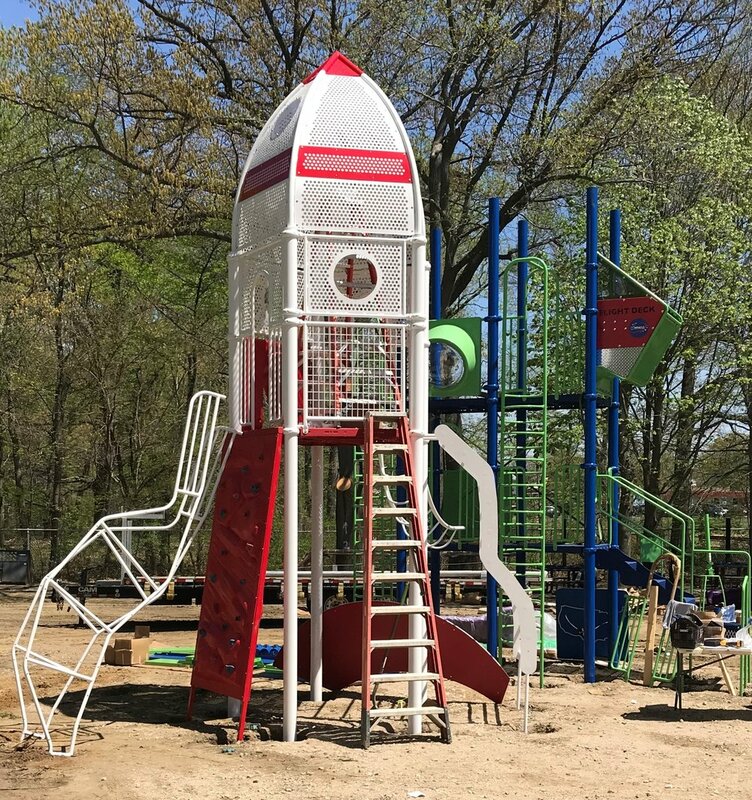 Check out this cool playground, with rocket ship and control tower structures, Jax Web climber, Space Shuttle spring riders, swings, inclusive Ten Spin, Flip-Flop and Dome climbers, and yes, a few tables and benches for the adults. I mean, come on, watching these kids play is tiring! The Miracle Custom Design department worked tirelessly on this one, and you can see they've come up with some great ideas. We're excited to see these products being installed, and will be sure to post when the completed structures are ready for play! As always, all Miracle Recreation equipment meets the standards set by the National Recreation and Park Association and ASTM. Many of our products are ADA friendly, and we make sure to include ground-based activities for those unable or uncomfortable with climbing. If you're looking for some creative ideas for your play space, be sure to contact us here at Liberty Parks and Playgrounds. We'd love to help you get ready for the fall with a brand new play area, or maybe just some timely upgrades! Let your local representative visit your space and get some ideas together for your review. Together we can keep that Custom Design department busy! Newer PostAshland Park now complete!